Bongo Comics Group began publishing its quarterly, 64-page, Simpsons Classics magazine way back in 2004. Over the next eight years and thirty issues, we reprinted the first sixty issues of Simpsons Comics. Now, rather than sticking to the tried and true chronological rollout of our hard to find back issue of our main “Simpsons” title, we thought it was time to shake things up a bit.. First of all, we are comic book people, not magazine people. And secondly, why just bring back stories from one comic book title when we have a whole host of other books with awesome stories just ripe to be rediscovered by new readers. With that in mind, we are announcing the return of a whole new Simpsons Illustrated. What’s Simpson Illustrated you ask? Well, way back in 1990, Matt Groening ventured into publishing with a fan magazine filled with “Simpsons” news, interviews, comic stories and games. 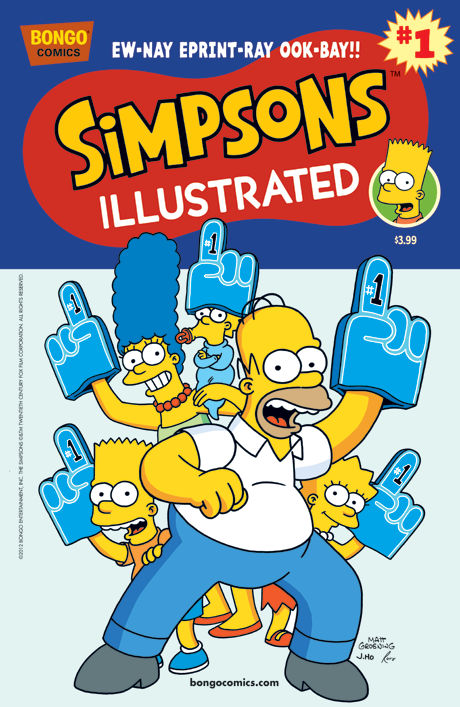 Those ten, quarterly, magazine–sized issues of Simpsons Illustrated along with the January 1993 one-shot Simpsons Comics and Stories were actually the birth parents of what you now know as Bongo Comics Group. So, returning to our roots, we have melded the two formats to create a new 48-page comic chockfull of cover to cover comic stories from a variety of our historical comic titles, including: Simpsons Comics, Itchy & Scratchy Comics, Bartman, Radioactive Man, Krusty Comics, Lisa Comics, Bart Simpson, Treehouse of Horror and Simpsons Super Spectacular. Each issue of Simpsons Illustrated is a handpicked grab bagof the very best of Bongo. The very first issue of Simpsons Illustrated finds Principal Skinner revealing some little known and secret stories from Springfield Elementary School’s fabled permanent record room (Simpsons Comics #75), a world-record setting tale about Ralph Wiggum (Bart Simpson #9), and the classic, “Lo, There Shall Come a Bartman from Matt Groening’s first “Simpson” comic book offering, Simpsons Comics & Stories #1.